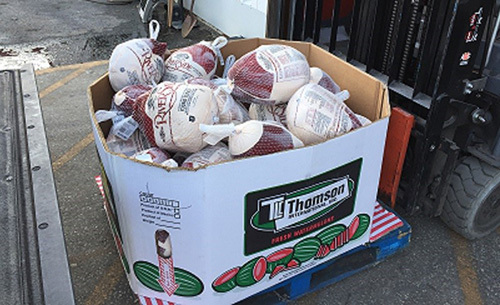 Locally, more than 900 pounds of turkey and nearly 700 pounds of nonperishable items were collected during the two-week drive, which ran from November 2 to 16. In addition, the annual food drive raised $1,130 in cash, which calculates to more than 8,000 pounds of food. Charleston team members delivered the items to the Lowcountry Food Bank to distribute to families in time for the holiday. The company’s efforts provided more than 149,000 meals to local families. “Our team is passionate about helping others in need right here in our community. With Thanksgiving being all about gathering with family and friends and counting our blessings, we were pleased to be able share that spirit of giving thanks and sharing with our neighbors,” said Doug Blanton, Design City Manager for David Weekley Homes in Charleston. In Charleston, the Thanksgiving Drive benefitted the Lowcountry Food Bank, an organization that will distribute 25 million pounds of food this year to people at risk of hunger in 10 coastal counties in South Carolina. “We can’t thank you all enough for your continued support. Your team is making a tremendous positive impact on our community for Thanksgiving,” said Mary Brook, Food Resource Manager at Lowcountry Food Bank. Team members from David Weekley Homes donated 1,605 pounds of turkeys and canned and nonperishable food items to the Lowcountry Food Bank to benefit families in need. The mission of Lowcountry Food Bank is to lead the fight against hunger in our community. The Lowcountry Food Bank was founded in 1983 as a clearinghouse for donated food items through the generosity of both the Coastal Community Foundation of South Carolina and Trident United Way.